Mitt Romney: Was pro-choice, now proudly pro-life. Rudy Giuliani: Personally oppose abortion, but let the woman decide. Barack Obama: Bush & GOP dug budget hole; need years to dig out. Barack Obama: Save $150 billion in tax cuts for people who don�t need them. Bill Richardson: Balanced 5 state budgets; priority to balance federal budget. Bill Richardson: Supports restricted Constitutional balanced budget amendment. Bill Richardson: Save $150 billion in tax cuts for people who don�t need them. Chris Dodd: Federal budget much more complicated & diverse than states�. Hillary Clinton: Look back to 1990s to see how I�d be fiscally responsible. Joe Biden: Balancing budget is about priorities; GOP made wrong choices. Joe Biden: Save Pentagon spending by getting the troops out of Iraq. John Edwards: Get rid of structural deficiencies in American economy. Duncan Hunter: Budget deficit & trade deficit to China create security risk. Fred Thompson: $9 trillion debt affects our national security. Fred Thompson: Deficit spending ok for military, infrastructure, and R&D. John McCain: Loss of economic strength leads to losing military strength. Mike Huckabee: Do things differently so people need not sacrifice. Mitt Romney: Economic strength comes from people, not from Washington. Mitt Romney: Cut deficit via waste, like 342 different economic programs. Ron Paul: Give up American empire; that reduces debt without sacrifice. Ron Paul: We spend too much, tax too much, & print too much money. Rudy Giuliani: Retire 42% of federal employees in next decade, to save $20B. Rudy Giuliani: Restrain Congress� spending; don�t ask people to sacrifice. Rudy Giuliani: 10% across-the-board cut; people can get services other ways. Tom Tancredo: End womb-to-tomb protections; stick to Constitutional limits. Barack Obama: Cap the farm subsidies for Fortune 500 companies. Bill Richardson: Eliminate $73 billion in corporate welfare. Joe Biden: We�ve yielded to corporate America on trade. Rudy Giuliani: Reduce corporate tax from 35% to 25%, to increase revenue. Rudy Giuliani: FactCheck: Corporate tax cut would reduce revenue by half. Cindy Axne: Supports decriminalization, not necessarily legalization. Barack Obama: Get parents re-engaged in educating the children. Bill Richardson: Make education a top priority and scrap No Child Left Behind. Bill Richardson: FactCheck: NM teacher salary only moved from 44th to 36th. Bill Richardson: FactCheck: NM test scores have not made �enormous progress�. Chris Dodd: Parents are the first teachers. Hillary Clinton: Fully fund special education & 21st century classrooms. Joe Biden: Hire more teachers and pay them for smaller classes. John Edwards: Provide continual education for those in the work force. John Edwards: A comprehensive plan to improve education. Alan Keyes: We allowed the judges to drive God out of our schools. Duncan Hunter: Unions and status quo run good teachers out of teaching. Fred Thompson: The NEA opposes school choice; we must stop them. John McCain: We need more choice and competition in education. Mike Huckabee: Education is a state issue, not a federal issue. Mike Huckabee: FactCheck: AR improved test scores, but still below-average. Mitt Romney: Education is not just the teachers� union. Mitt Romney: Bush was right on No Child Left Behind. Mitt Romney: FactCheck: US scores at 50% internationally, not 10%-25%. Mitt Romney: FactCheck: MA 1st in test scores, but was 1st before Romney. Ron Paul: Encourage homeschooling & private school via tax writeoff. Rudy Giuliani: Let parents be the deciders on their children�s education. Tom Tancredo: We don�t need the Department of Education. Bill Richardson: 30% renewable sources in our electricity by 2020. Bill Richardson: FactCheck: Reducing GHGs by 90% costs households $800/yr. Joe Biden: The energy challenge take sacrifice and is a moral crusade. Duncan Hunter: Give incentives in R&D to find new energy sources. John McCain: Climate change is real and must be addressed. John McCain: FactCheck: Oil independence will take 25 years, not 5 years. Mike Huckabee: Biofuel mandates are not necessary. Mitt Romney: Invest in new technologies to get us off of foreign oil. Tom Tancredo: Give incentives in R&D to find new energy sources. Barack Obama: Promote green technologies and fuel efficiency standards. Chris Dodd: Advocate a corporate carbon tax. Hillary Clinton: Advocate a cap and trade system. John Edwards: Deal with energy independence in a serious way. Mitt Romney: FactCheck: Teenage birth rate declined from 1991 to 2005. Mitt Romney: Strong military, strong economy, and strong families. Barack Obama: Obama Doctrine: ideology has overridden facts and reality. Barack Obama: China is a competitor but not an enemy. Chris Dodd: Stay engaged; US has been AWOL on Israel for 6 years. Chris Dodd: Human rights and security are not opposing interests. Chris Dodd: FactCheck: No, Chinese government prosecutes slavery. Hillary Clinton: Establish coherent diplomatic approach toward China. Hillary Clinton: Establish leadership & moral authority via multilateralism. Joe Biden: Doctrine of crisis prevention, not preemption. John Edwards: US has ignored China because of obsession with terrorism. John Edwards: Edwards Doctrine: long term vision over ad hoc policy. Ron Paul: Focus on the Iraq war and foreign policy. Barack Obama: Enforce existing safety laws against Chinese products. Barack Obama: NAFTA needs to be amended. Bill Richardson: Ban contaminated toys and food from China. Chris Dodd: China gains advantage by slavery & currency manipulation. Chris Dodd: We need to get fair with China. Dennis Kucinich: We need a policy of constructive engagement with China. Dennis Kucinich: Either buy America or bye-bye America. Joe Biden: No to tariffs; just enforce the law. Joe Biden: Built environmental and labor standards in trade agreements. John Edwards: Enforce country-of-origin labeling laws to deal with China. John Edwards: Human rights should be central to the US trade policy. Duncan Hunter: NAFTA is a bad business deal. Fred Thompson: Free and fair trade is the backbone of our economy. John McCain: Consider subsidies a mistake, and oppose them. Mike Huckabee: A free country must feed, fuel, & fight for itself. Mitt Romney: Re-negotiate trade deals with China and other countries. Ron Paul: Look at the monetary system and deal with the trade issues. Rudy Giuliani: NAFTA has been a good thing and should be enforced. Tom Tancredo: Oil trade imbalance is a national security risk. Tom Tancredo: NAFTA has been a disaster for many places, especially Mexico. Lamar Alexander: Fast-track helps farm exports. Bill Richardson: Focus on Iraq, energy reform, and restoring the Constitution. Hillary Clinton: Never abuse the purpose of signing statements. Joe Biden: Radical change to preserve family farmers. John Edwards: Use signing statements as in the past, unlike Bush. Alan Keyes: Focus on moral sovereignty, tax reform, & sealing the border. Duncan Hunter: Focus on the military, immigration, & the industrial base. Fred Thompson: Focus on the budget, social policy, and bipartisanship. John McCain: Focus on homeland safety, restoring trust, and fiscal policy. Mike Huckabee: Focus on uniting the country. Mitt Romney: Focus on global Jihad, immigration, tax cut, and healthcare. Rudy Giuliani: Focus on terrorism, immigration, tax cut, & small government. Tom Tancredo: Focus on immigration and a war against radical Islam. Orrin Hatch: Mental health check as part of background check. Orrin Hatch: Gun violence problems can be solved by more enforcement. Barack Obama: Reforms in prevention and drug price negotiation save money. Barack Obama: FactCheck: Reducing obesity would save $18B, not $1T. Bill Richardson: Universal health care is a right for every American. Bill Richardson: FactCheck: Between 7% and 31% of costs are administrative. Joe Biden: Cut $350B in military programs, from Star Wars to F-22�s. Fred Thompson: Intelligence and parts of our military were neglected. Barack Obama: Paying more at Wal-Mart is worth it for having US jobs. Chris Dodd: Preserve and protect the farms in Iowa. Mike Huckabee: Excessive taxes, red tape, and litigation cause job losses. Cindy Axne: Government out of church decision on contraception insurance. Barack Obama: Focus on Iraq, revising presidential power, and healthcare. Chris Dodd: Focus on the Constitution, Iraq, and the Middle East. Hillary Clinton: Focus on foreign policy and revising executive orders. Joe Biden: Focus on Iraq, ending torture, healthcare, and education. John Edwards: Focus on the Iraq War, healthcare, and global warming. Alan Keyes: Be authentic about who you are. John McCain: Able to work with others with own set of principles. Mike Huckabee: Treat others as you wish to be treated. Mitt Romney: Draw upon the strengths of the conservative principles. Ron Paul: All political action�s goal should be to preserve liberty. Ron Paul: The term �revolution� was coined by the supporters. Elizabeth Dole: Economic health masks serious societal problems. Fred Thompson: Reform entitlements now so our grandkids don�t have to. Bill Richardson: End unfair & unequal tax structure for wealthiest 2%. Hillary Clinton: Want to restore the tax rates we had in the �90s. Joe Biden: Save $150 billion in tax cuts for people who don�t need them. John Edwards: Get rid of the tax breaks for the wealthiest Americans. Alan Keyes: FairTax turns off spigot that funds political ambitions. Duncan Hunter: The IRS and current tax system cost too much. Duncan Hunter: FactCheck: Cost of IRS compliance is $150B,not $250B. Fred Thompson: Preserve the tax cuts of 2001 and 2003. John McCain: Reform the tax code that nobody trusts and believes in. Mike Huckabee: Support FairTax with a tax credit for the poor. Mitt Romney: Reduce the tax burden on middle-income families. Ron Paul: The most sinister of all taxes is the inflation tax. Rudy Giuliani: Support a flatter and simpler tax and less corporate tax. Tom Tancredo: Believe in a fair tax system. Art Small: Tax cuts have short-term benefit and long-term costs. Barack Obama: Iran: Bush does not let facts get in the way of ideology. Chris Dodd: Exercise caution but pursuing diplomacy with Iran. Chris Dodd: Keep all options on the table for Iran. Dennis Kucinich: I was right the first time; now no evidence of nukes in Iran. Dennis Kucinich: US role: security for Israel and a state for Palestine. Hillary Clinton: Continue diplomatic engagement with Iran. Hillary Clinton: Believed, with others, that Iran was pursuing nuclear weapon. Joe Biden: Accept NIE conclusion that Iran stopped nukes in 2003. Joe Biden: Muslims don�t like us because they do not trust us. John Edwards: Stop the neocons march to war with Iran. John Edwards: Muslim dislike from Bush�s bullying abusive behavior. Mike Gravel: Iran�s not a problem, never has been, never will be. Tom Tancredo: Stop policing Iraq, but cannot leave. Art Small: Neocons still believe there are WMDs in Iraq. Michele Bachmann: Liability shield to allow charities to provide healthcare. Chris Dodd: Help lift people out of poverty and give them opportunities. 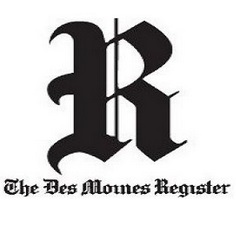 The above quotations are from Media coverage of IA political races in The Des Moines Register.